One day in the fall of 2009, my new friend Arley-Rose Torsone came by my studio in Providence. She was interested in learning to make fonts and I had promised to show her the basics of FontLab. In that initial session, I showed her how to draw beziers and set sidebearings. I drew a few glyphs, and we talked about the qualities of the control characters: what should the shoulders of the n look like? How round should the O be? It didn’t occur to me at that moment that I would eventually expand this font into 48 styles — I was just having fun with a friend. Time passed, and as I started transitioning to full-time type design, I forced myself to only use my own fonts in my remaining graphic design projects. That meant that I needed a workhorse sans for day-to-day use, and so I started thinking about what that might look like. Like most graphic designers, I had used a lot of Gotham and Neutraface, as well as fonts from Village like National and Galaxie Polaris. I admired the utilitarian qualities of these fonts — hardworking and versatile with just the right amount of personality. I realized that the sketch from 2009 functioned similarly to these fonts, but with a distinguishing design feature: squared corners instead of a geometric or strictly grotesk construction. In my early days of graphic design I used lots of DIN (it was the early aughts, after all), and that engineered sensibility found its way into aspects of this new font. 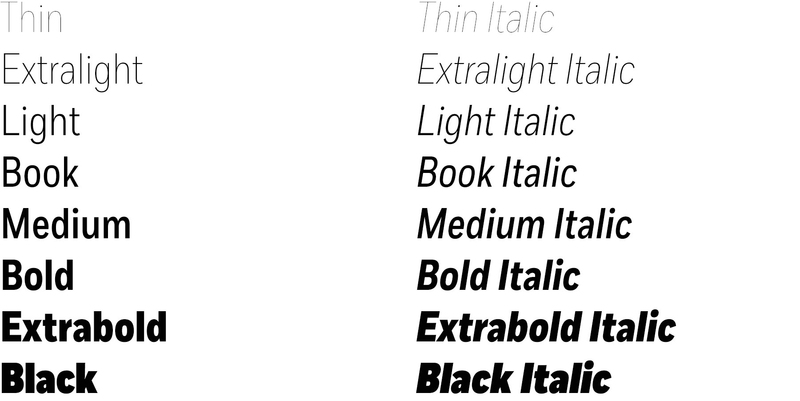 But Fort was to be a hybrid, somewhere between DIN’s rigid construction and a grotesk’s more organic sensibility. The closest historical example to Fort that I’ve found is a 1970’s novelty called Heldustry, a mashup of Helvetica’s proportions with Eurostile’s squared curves. 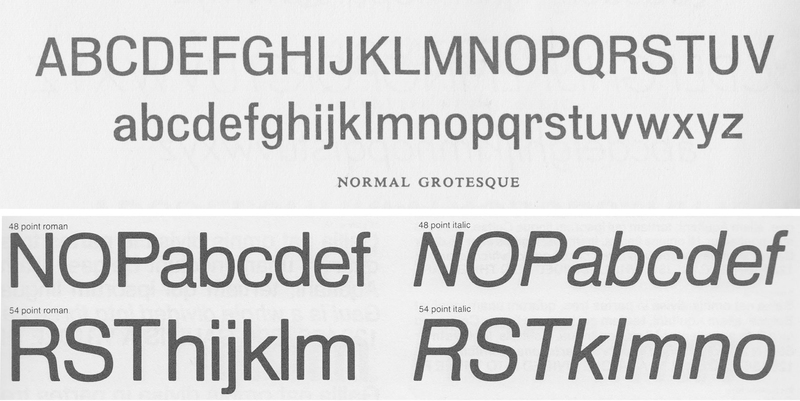 Other examples in the realm of squared grotesks are Permanent and Normal Grotesk. Permanent has Helvetica’s 90° terminals, and Normal Grotesk has angled terminals, but with distinct straight segments on the sides of the curves, something I consciously avoided in Fort. I had recently finished Aero as a collaboration with Chester Jenkins, which had nine styles that dramatically swell from whisper thin to unbelievably black. I wanted to make a Thin weight for Fort as well, and something I always wish I’d done with Router was to make a heavier weight, but Router’s Bold was about as heavy as I could figure out how to draw at the time. With Fort I was able to draw a heavy Black and fairly light (10 unit) Thin. The italics are subtly redrawn. Because of the squarish rounds in characters like a b d p q, I kept more points in the curves than I normally would. This caused some kinks in interpolation, but I wasn’t happy with the shapes otherwise. In the end you can’t really tell that they’ve been redrawn, but that’s the point — if they hadn’t been redrawn, they’d look wrong. The first use of Fort was for an art book (including a special strike-out version) by Adam Lucas, then a grad-student at RISD. 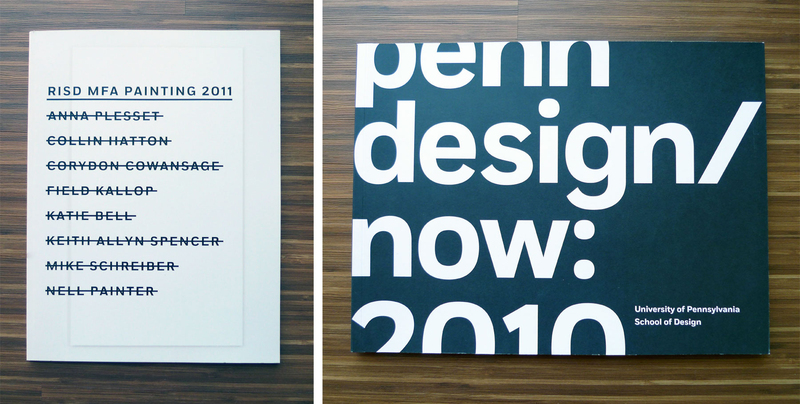 It was also used by Pentagram in a prospectus for UPenn Design. This was my first lesson in the benefit of having designers use my in-progress fonts, something that has always helped make them better. Through the process, I realized that the overshoot (the distance the curves go below the baseline and above the cap/x-height) was a little too aggressive in early drafts, and that the x-height needed to be larger in the bolder weights. I also added some typographic niceties like old style figures and alternate characters for the G K k a y.
I finally finished the fonts in the summer of 2012, shortly after joining Village as a full foundry member. A year or so later, I started getting requests for condensed styles, so I did some preliminary tests. I thought it would be pretty straightforward: just scale the fonts horizontally and compensate by adding weight. Early on, a type design mentor had told me that +/- 1 unit in a condensed font can make all the difference. I didn’t see how that was possible then, but it became clear as I started building the full family of alternate widths. Perhaps because the curves were already ‘squarish,’ I didn’t find it necessary to add straight segments to the sides of the curves, a common feature in condensed fonts. I first ‘completed’ the new widths of Fort for AFAR magazine, but rethought the range of widths shortly after. I decided my Condensed wasn’t narrow enough to really differentiate from the regular width. I also redrew many of the characters, realizing that as a font gets more condensed, open forms like the C G S need to close up more, otherwise feeling too open. I cut the middle width and create a much narrower version and named that ‘X-Condensed’. AFAR wanted italics for all the styles, and I debated whether to draw italics for the new XCondensed weight. Almost on a dare from a type-designer friend, I knuckled through it and drew the italics for all the widths. It would have felt unbalanced not to, and in the end, I’m glad I made them. I think narrow italics can be useful, and are a worthwhile addition to an underserved part of the typographic spectrum. Fort Condensed is available in eight feature-rich weights in Roman and Italic.